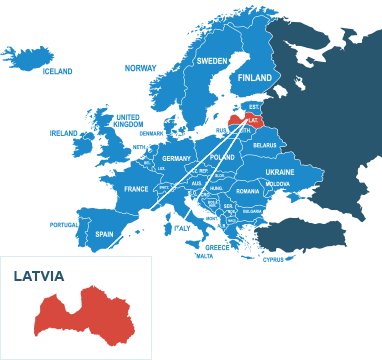 Pallet delivery to Latvia is now extremely easy thanks to National Pallets. As part of the UK's largest pallet network, you can rely on a safe, secure and cost-effective service to and from Latvia every time. Latvia is a country in Northern Europe on the eastern shores of the Baltic Sea. Latvia has a population 1.99 million and area of 64,589 km2, making it the 27th largest country in Europe, it’s terrain is marked by beaches, as well as dense, sprawling forests. With neighbouring countries Lithuania, Estonia, Russia and its maritime neighbour Sweden, Latvia is quite a prominent trade hub within Northern Europe. Through our consignment tracking facility, you can track the pallet from the minute it's collected to the minute it's delivered, and we'll even send you an email informing you when the pallet delivery has been made. Why not check out all our pallet delivery services from the UK to Latvia? Simply request a free instant online pallet quote by using the quick quote option on the right and send a pallet to Latvia today! Do I need to deal with customs when shipping a pallet from the UK to Latvia? No. As Latvia is a member of the European Union, you don’t need to worry about dealing with international customs when shipping your pallet. How much does it cost to send a pallet to Latvia from the UK? You can send a standard quarter pallet (up to 250kg) for as little as £158.20 ex VAT. For more information on pallet prices and dimensions, click here to get an instant quote. Orders must be placed before 11am if importing or exporting to Latvia to qualify for quoted time scales. Standard delivery time is 6 days, however express 5-day services are also available. We are able to ship the majority of goods to and from Latvia, however there are some exclusions, these are listed below. Alcohol: an inventory must detail exact number and size of bottles, exact alcoholic strength in percent and value of each bottle. Orders must be placed before 11am if importing or exporting to Latvia to qualify for quoted time scales. Prices quoted are based on quarter size pallet with economy options selected. Delivery and collection prices subject to VAT.